Description: This course examines the development challenges faced by contemporary Native nations. Utilizing numerous case studies and extensive research on what is working and what is not working to promote the social, political, cultural and economic strengthening of American Indian nations, the course emphasizes themes applicable to community development worldwide. 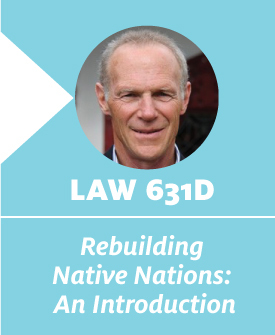 Historical and relevant federal Indian policy and case law are used as background material, but the course emphasizes the interdisciplinary nature of the “nation building” revolution underway in Indian Country. Additional emphasis is placed on how tribal initiatives can conflict with federal case law, state jurisdiction, and federal policies and politics.